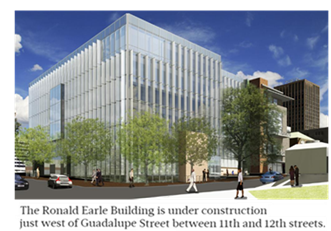 ​​​​​​​​​AUSTIN – Named after the longstanding district attorney, the Ronald Earle Building is under construction at 416 W. 11th St. The seven-story, 125,007-sf structure, which includes underground parking, is scheduled to be finished in spring 2018. The total cost of the project is $45 million. The Travis County Commissioners and Page architectural firm shared ​the rendering. The building will primarily serve county prosecutors​. ​See ​Austin Office Market Research​ for updated quarterly data.